Veteran, Vintage and Classic Cars, Motorcycles, Commercial, Agricultural, Military, Steam and American Classes on show. If you are the proud owner of a Classic Mini, Jaguar Mk2, Triumph Herald or Ford Capri,this year is a special one for you! These cars will be grouped together in anniversary displays and awards made to the best of each type. Sporting Bears Dream Rides Take a ride in the car of your dreams. The cars owner will take you on a drive through the Borders countryside, simply for a donation to charity. 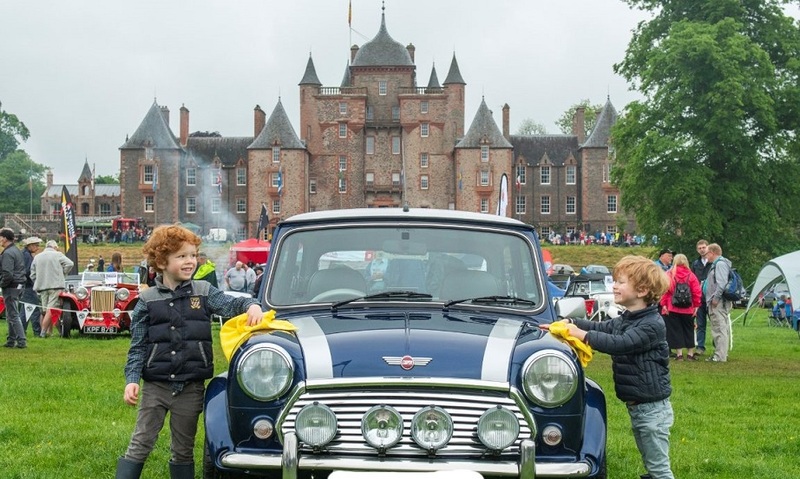 With more than 1200 vintage and classic vehicles of all shapes and sizes making the journey to Thirlestane, this is one of the biggest and best car rallies in the whole country. To celebrate the 60	th anniversary of the launch of the Mini, the theme of this years show will be The Year of the Mini. Fabulous events including a Classic Mini Raffle, a record-breaking team challenge to see how many people we can fit into a Mini! Surprise celebrity guests, a celebration of Minis at the Movies and much more.